It was clear after qualifying that Ferrari was going to struggle on Sunday because the Bridgestone tires were just not up to the job against the Michelins. Everyone was very polite but it was very clear that the Japanese rubber was not good enough. "I am not satisfied," said Bridgestone's Hisao Suganuma. "We will be pushing hard in the next few weeks." Michelin on the other hand was very happy. "I think performance on track spoke for itself today," said Pierre Dupasquier. "I am not sure that there is a great deal that I can add. I think that Michelin has shown a clear tire-performance advantage in the last three Grands Prix, which indicates to me that our simulation and evaluation procedures are becoming ever more refined as we gain more F1 experience." The team that has gained the most from the Michelin burst of competitiveness has been Williams, and despite a rather less than impressive failure to win in Canada the team has collected up 47 points in just three races. It is now ahead of McLaren-Mercedes in the World Championship and only 13 points behind Ferrari. It would be unkind to say that Ralf Schumacher backed into the win but when the dust had settled that was the impression one got. This race belonged to Kimi Raikkonen. But to finish first, first one must finish and Raikkonen decidedly did not achieve that goal. The news came in a series of alarming smoke signals on the Finn's 26th lap and you did not need to be a Red Indian (Native American for those of a liberal bent) to read the message. "This engine has expired" it said. Raikkonen said a number of complicated words in Finnish which suggested to those from the North that he was not very happy but he tried to be polite when he discussed the issue in English. "I had no indication this was going to happen," he said. "The car was feeling great. I was going to win the race easily." Up to the blow-up, Raikkonen had driven a perfect race. He took the lead from pole position and left the others to squabble amongst themselves. He was nearly five seconds ahead of Ralf Schumacher when the engine went and although the two men were on slightly different strategies it did not look likely that Ralf would have won back enough time to have beaten Kimi on the road. And it was a triumph for Ralf as well. He took a huge amount of criticism after Canada for driving without much aggression and simply following his brother but after his win at the Nurburgring Ralf poked a little fun at his critics saying that it just went to show that a "bad driver can win races"
Beyond the result, it was for most of the afternoon not a race of great interest. Things livened up considerably when Montoya and Michael Schumacher collided on lap 43 as Michael tried to fend off Monty for second place. Montoya was very obviously faster and tried to pass the Ferrari. He was blocked on the inside and so decided to go the other way and seemed to be in clear when Michael decided not to give way. "I thought I gave him plenty of room," he said. "I wasn't going to give him all the track. I gave him enough to go round the corner." The two cars made contact and Michael spun. "In my opinion it was a straight-forward racing incident," he said. "He was faster than me, tried to pass, gave me just enough room to survive. Maybe I could have wished for a little bit more space." Michael's car ended up stuck in the gravel but with a little help from three marshals and what appeared to be a spectator (although it was in fact the man who had driven a tractor to the scene to pull the Ferrari away into retirement) the Ferrari was pushed back on to the track, the logic being that it was in a dangerous position but still had the engine running. Michael rejoined in sixth and there he stayed until Coulthard's retirement when he moved to fifth. On the last lap he caught Alonso but could not pass the Spaniard in the final couple of corners. 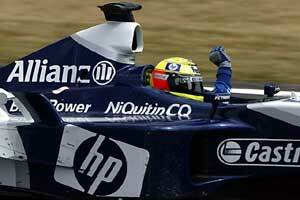 The man who gained most from the incident was Barrichello who had had an otherwise rather dull race. He had struggled with the handling of the car (otherwise known as tires) and eventually ended up third. He called it "a fairly good result". Fourth place went to Fernando Alonso in his Renault and he had a very busy day. Early on he was battling with his team mate Jarno Trulli. He dealt with the Italian at the first pit stop. Trulli would eventually go out with what the team called "a fuel pressure problem" just a lap or so before his second stop and there were some folk in the paddock who felt that perhaps Jarno might have run out of petrol.. It did not matter much. He did not finish. But Alonso (as usual) did. In the closing laps he was under extreme pressure from David Coulthard who had spent the afternoon making up for his poor qualifying. He lost some time during a pit stop when he left a little too early and had to stop the car but otherwise he drove a strong race. In the closing laps we was all over Alonso until lap 57 when Alonso suddenly put on the anchors much earlier than David expected. "He braked 10 meters earlier than he had on the previous lap," said David. The Scotsman swerved to avoid running into the back of the Renault and lost control, the car bouncing in alarming fashion into a gravel trap. David was not impressed. "I have my own views on the incident which I will discuss privately with Alonso but at the end of the day it is for the stewards to decide." The stewards did decide. After examining the evidence of drivers and team representatives, and seeing video and telemetric evidence the stewards decided that "the incident requires no further judicial action". In the laps that followed Alonso's car became more and more difficult and he was only just able to hold off Michael Schumacher at the end of the last lap. One more lap and he would have lost fourth place to the Ferrari. Behind these two, albeit a lap behind was Mark Webber, who had planned to have a strong race and had decided to sacrifice qualifying with that in mind. He started 11th on the grid but dropped to 12th and then he was stuck behind a struggling Jenson Button. Jaguar decided to try and get rid of the BAR-Honda with an early pit stop but it did not work out and so Mark spent the second stint in the wheeltracks of Button and the two Toyotas which were both out of sync with their strategies because of different problems. At the second pit stop sequence Webber was finally able to get rid of the BAR-Honda and although he then pulled away there was no-one ahead to chase. They were simply too far ahead! Antonio Pizzonia had another bad day and at his second stop he was given the wrong tires by the Jaguar team. In addition he was clocked as driving too fast in the pits and given a drive-through penalty and all of that meant that he was 10th by the end of the race. Button made it home in ninth place having struggled with his car all day long. It could have been a lot worse. At the first pit stops Jenson came in, needing tires and fuel and as he was doing so, Jacques Villeneuve was there, having his car repaired after a series of excitements while dicing with Minardis. This had included a high-speed spin and then he ran into one of the bollards at the chicane and knocked off the front wing. The BAR mechanics did an impressive job and Jacques was despatched just 10 seconds before Jenson arrived. Given their history earlier in the year, this was a close call. In the end Villeneuve went out with a gearbox failure and everyone went home chuntering about what a bad weekend it had been. The final World Championship point went to Nick Heidfeld in eighth place and this was quite an achievement considering that Nick had started from the pitlane. He first had to thread his way between the Minardis and Villeneuve, who were having a fight of much cut and thrust (not to mention dust) but he kept his cool and then pulled clear of them all. His team mate Heinz Harald Frentzen finished ninth, 20 seconds behind Heidfeld, his decision to go on a three-stop strategy having not been a good one. Jordan made a similar mistake of judgement and the cars finished 11th and 12th with Firman ahead of Fisichella at the end, this having been caused by the fact that Fisichella had an extra stop after a puncture. The two Minardis came home 13th and 14th and Jos Verstappen called it "one of the worst races I have ever had." Toyota alas flattered to deceive. The team failed to finish both cars. Panis had his brakes lock up when he was running eighth in the early laps and he spun off. The same thing happened again later and that time the car stalled. But not as miserable as they were at McLaren. "Our objective will be to put today firmly behind us and concentrate on the remaining part of the season," said Ron Dennis. "We must not lose sight of the fact that we have a very competitive package."